This is one of a series of guides created by Radiant Law to help in-house legal teams improve their contracting processes. You can find other guides here. Although these guides are focused on handling commercial contracts, many of these technologies and approaches can be applied to other activities that you do. 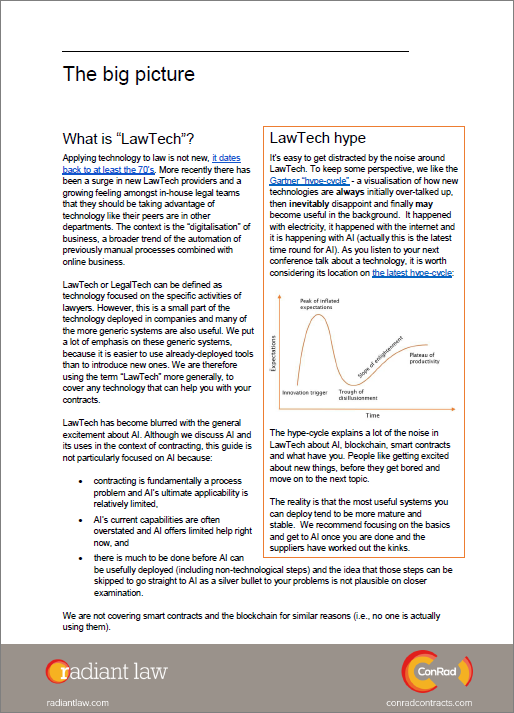 LawTech is both helpful and overhyped and finding the right path is hard. We published a LawTech Glossary with definitions for lots of the lingo you will inevitably be exposed to, which admittedly expressed some of our frustration with the hype. This guide is to assist you to find tools that will actually help, and ensure that they are actually used. Applying technology to law is not new, it dates back to at least the 70’s. More recently there has been a surge in new LawTech providers and a growing feeling amongst in-house legal teams that they should be taking advantage of technology like their peers are in other departments. The context is the “digitalisation” of business, a broader trend of the automation of previously manual processes combined with online business. LawTech or LegalTech can be defined as technology focused on the specific activities of lawyers. However, this is a small part of the technology deployed in companies and many of the more generic systems are also useful. We put a lot of emphasis on these generic systems, because it is easier to use already-deployed tools than to introduce new ones. We are therefore using the term “LawTech” more generally, to cover any technology that can help you with your contracts. there is much to be done before AI can be usefully deployed (including non-technological steps) and the idea that those steps can be skipped to go straight to AI as a silver bullet to your problems is not plausible on closer examination. We are not covering smart contracts and the blockchain for similar reasons (i.e., no one is actually using them). 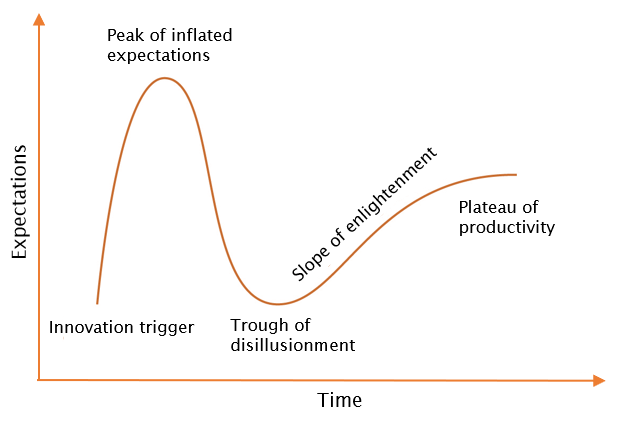 The hype-cycle explains a lot of the noise in LawTech about AI, blockchain, smart contracts and what have you. People like getting excited about new things, before they get bored and move on to the next topic. The reality is that the most useful systems you can deploy tend to be more mature and stable. We recommend focusing on the basics and get to AI once you are done and the suppliers have worked out the kinks. A single place for the business (and legal) to go on the intranet for self-service resources and help. Forms for the business to complete to get help from legal, ensuring that the relevant information is provided and potentially starting the matter tracking process. Systems that let you (or the business) generate tailored contracts based on answers to questions. Systems to automate the approvals process for first drafts created by the business. AI tools to flag issues in contracts on the other side’s paper. Online places to store draft agreements (and potentially emails) so that they can be accessed by other team members. 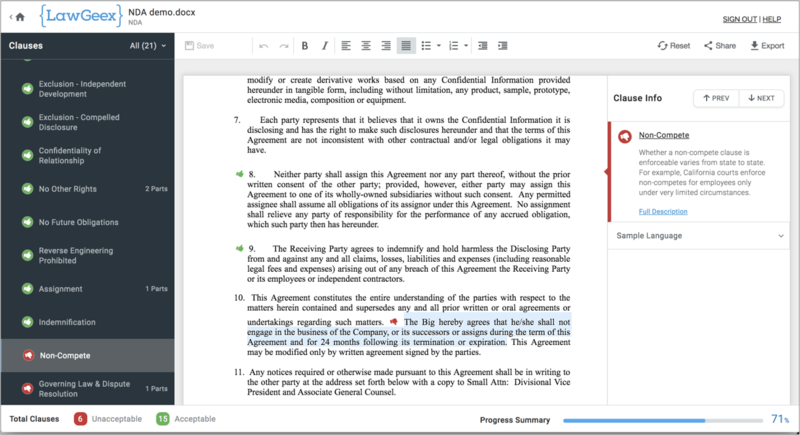 Additional buttons for Word to help lawyers format, check and update contracts during negotiations, as well as clause databases. Conference call systems that let you show your screen to the other side, enabling agreeing changes live during negotiations. 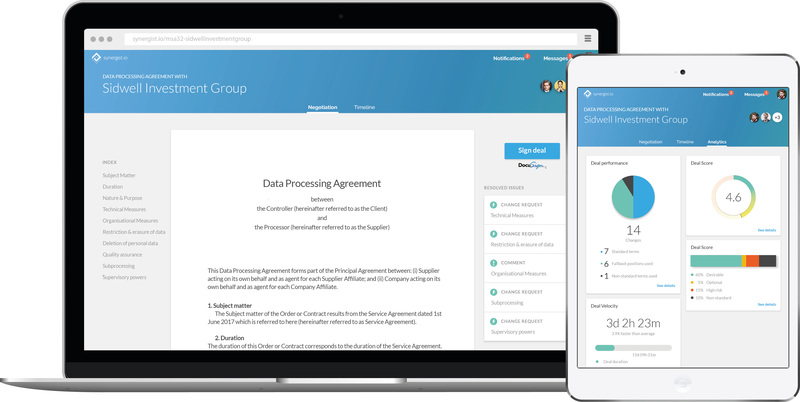 Online negotiation tools, with the contract being amended in the browser, rather than documents being sent back and forth. Online system for collecting approvals pre-signature for finalised contracts. Online systems for signing documents, avoiding the need for wet ink signing. AI tools for extracting key data points from signed contracts for inclusion in contract management systems or at a later date to answer questions. System for storing signed contracts and associated key data. Systems to track performance of obligations under contracts, sometimes implemented as a specialised type of contract management system for complex deals. System to track the status of all your matters, usually with a dashboard showing performance against key measures. Tools to show visually which parts of your contracts are being most negotiated. Phew, that’s a lot of systems. Point solutions: systems that just do one thing and nothing much else, and are often very good at what they do. End-to-end solutions: systems that cover the full contracting process from intake through to contract management. Traditionally, these suppliers came out of the contract management world and moved left to encompass the full contract lifecycle. They may not be as good at any particular activity as a point solution, but they have the advantage of connecting all the parts together. We prefer point solutions at Radiant, so we built the integrations needed to make things work together and can help you with this too. There’s no right answer for this one, other than not being paralysed. these systems are now well tested and much easier to deploy than when they were first released. So how do you get going with applying technology to your contracting processes? To help you see where you are in your evolution, we created the free Radiant Benchmark to allow you to map your current state against the capability maturity model and identify next steps. Those steps may well include some technology, but will likely also include process and materials improvements. Note that the capability maturity model is both descriptive (it covers the different evolutionary stages we see in practice), and is also to a degree prescriptive (there are reasons why other teams have gone through those steps in that order). We recommend you start with completing the Radiant Benchmark and considering what it suggests (or you can drop a few tens of thousands of pounds with a consultant for a similar answer). We know that LawTech is more exciting than sorting out your templates (the LawTech glossary was predictably a lot more popular on social media than our guide to contract templates) but the reality is that improving your templates is going to have a bigger impact on your contracting processes than most LawTech. As noted above, you can also jump start your use of technology across many of the different categories, by looking at end-to-end contracting systems that cover all of these components. A final word of warning: We regularly see companies caught up in complex evaluations of the many systems available in the market. The larger the company is, the worse this process gets. Getting something in place is better than analysis paralysis. Fewer tools: although users have lots of tools available, in practice they only use a handful. The usage tails off fast after the first two or three that are used daily, and if a user isn’t living in the application day-in-day-out, the application will tend to be forgotten about. If you think about what lawyers use, the first two positions are inevitably taken by email and Word (which may explain why many matter management tools are embedded in Outlook etc). If you are looking to your users to adopt a new system, think about what else it will compete with and whether other tools need to be dropped and not just added to. Flexibility v completeness: It is tempting with a new system to seek completeness - making sure that it does everything you ideally wish for. Be aware though that your use cases will change and in practice what you think are key priorities may turn out to be unused (we are regularly wrong on this front). We’ve found that giving users flexible and general tools is often more helpful in the long run than a very specific system. It’s not a total accident that Microsoft has done as well as it has with the Office suite. Not all data is equally confidential: There are understandable concerns about putting highly confidential data in external systems. IT departments are struggling with how to handle the wave of new cloud-based systems to ensure that security is maintained. There is a middle ground though between a blanket ban on use and data being uploaded everywhere. We suggest a risk-based approach that looks at the impact of a data leak. Are there tools that you can agree with IT will be allowed on the basis that the data that is stored is not highly confidential? Large contracts v repeatable contracts: There is a fundamental difference between large and small contracts. With small repeatable contracts, it is relatively easy to automate the different stages. There is a consistency to them, there is less at stake and it is easier to get a process in place. With large contracts, a team will often be involved, they can easily become a “lifestyle choice” and the contracts are likely to be highly bespoke. The upshot is that you should expect to have significantly fewer automation opportunities with large contracts. Pain v gain: The reality of change is that everyone likes the idea of things getting better, they would just prefer the actual change to happen to someone else. No one likes being told to change how they work and this only gets worse with lawyers, a group noted for having a strong preference for autonomy. A key question to ask before rolling out any new technology is: “is it worth it?”. By that we mean, will the benefit be so great for the individuals involved that it will be overwhelmingly worth any pain they will go through? And if the answer is that the benefit will be primarily to the company, but the individual will feel the pain, then it’s going to be a struggle to implement the new system. Vision only goes so far, if the pain is immediate and the benefit is theoretical and in the distant future. Given that the majority of transformation projects fail in businesses, our recommendation is to avoid projects where the pay-off balance is wrong, because if the project fails then there is no value to the business. Self-help: One of the biggest impacts you can make on your workload is helping the business help themselves. To do that, you want the business to have a single place to go by providing a useful portal. That portal will become the place where you provide not only the latest materials and resources, but also the intake form for support requests. We discuss document automation below and you will want ultimately to give access to this via the portal for use by the business. Taming the intake process: To balance the load across your team and ensure the right people are working on the right matters and urgent support is prioritised (triage) you will want to have a single place for the business to go to request support (intake). This can start as an email address, but ideally will eventually become a form (or be triggered by another system used by the business). 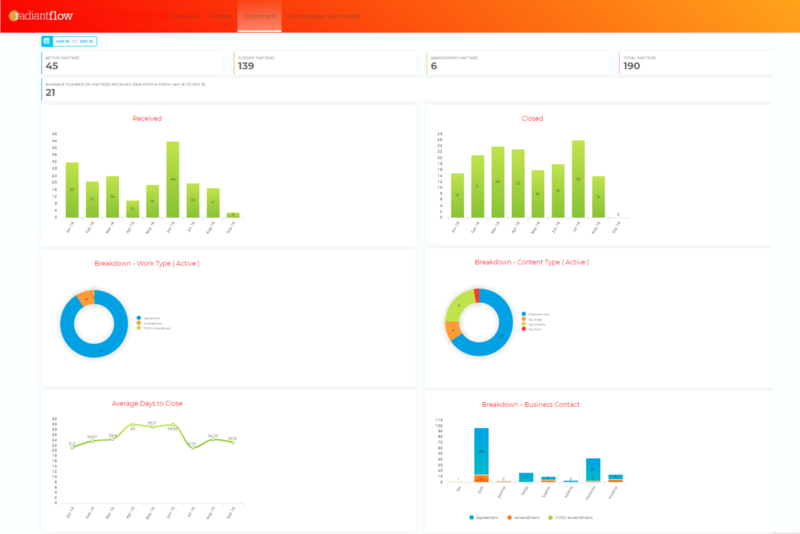 Tracking and Analytics: If you start to track what your team and suppliers are working on, you will start to get data. From data, you will be able to see where there are opportunities to improve your processes and the impact you make through ongoing improvements. An online intake form can be used to trigger that process, avoiding the need to re-key data. Matter tracking will also give you a dashboard, giving you an eagle-eye view of what is going on. Your company inevitably has an intranet. The technology underpinning these vary, but having a single place for business users to go should be located within the intranet. You don’t need to buy a system for this part, just adopt what your company is already using. You can link to other systems from here, so you don’t need full integration to get the benefits of having a landing spot where legal can curate materials, information and systems that are helpful to the business. Capabilities: You will ideally want a system that is capable of easy editing by the team, can host documents and is easy to locate within the broader intranet. We like to use wikis, but any system that can allow for quick changes should suffice. The go-to favourite for these kinds of systems is now Microsoft SharePoint (or if your corporate IT is built around Google Apps, Google Sites). Use by the legal team: Your team will also need a single place to go for all of their know-how. You can use the same system for both, and they will normally allow different access rights to be granted so that you can control who within the wider organisation sees what. The end-to-end contracting process: The contracting process is, of course, broader than just legal. Sales, procurement, finance and other contract owners are also key constituents. This raises a challenge for where to locate helpful information. Consider how best to work with the other teams in providing relevant information that covers the end-to-end contracting processes. Ongoing curation: Plenty of legal teams have a page on the intranet, few have a comprehensive and current resource. You will need to have someone responsible for keeping it up to date and helpful. you get more complete instructions, reducing the need for an initial back-and-forth over the details of the deal. As part of implementing a new intake process, especially where you are moving from the business contacting their favourite lawyer, you will need the business’ buy-in. This will be significantly helped by agreeing target performance times to acknowledge requests. As part of implementing this process, you will want to consider how triage should be done and work distributed, including how to make sure that new matters aren’t missed. The intake process can start with something as simple as a single email address (e.g., legalintake@companyname). You can set up mailing lists so that multiple team members receive the email. Ultimately, you will want an intake form so that you have complete information. This is likely to vary by matter type, but you can create online forms that have different questions depending on answers given to previous questions. As an interim step, you can create interactive pdf forms, which also have the ability to show only the questions relevant to the particular matter. The advantage of these is that they can be emailed to your new intake address, allowing you to get going quickly. Ideally, the intake form will trigger your matter tracking system once that is implemented. At its simplest, a matter tracking system can be a shared spreadsheet (or even better a kanban board) showing who is working on what. You can build something simple in Google Sheets (which is better than Excel, as multiple users can edit at the same time) or Trello. Including workflow to handle hand-offs between departments. There are systems that focus on spend management; systems that focus on contracting; systems provided by external suppliers for their services; systems that focus on all of intake and management (but don’t model the contracting process) and so on. Right now, few teams have really cracked this challenge, especially when you overlay the need to integrate with other systems within your organisation. Our advice is to accept that you may not have a single view for everything, but try to keep to as few systems as possible and prioritise your most pressing needs. Ticketing systems: Your IT department is likely to have a ticketing system for tracking IT issues and requests for help. These can be repurposed as a matter tracking system for the legal team. Business Intelligence tools: Somewhere within your organisation a team of analysts are likely using business intelligence tools such as Microsoft Power BI or Tableau to do visualisation of data and other data analytics, in other words, tools to build dashboards. In addition, workflow systems worth looking at include Kim, Onit and ThinkSmart. The automation of drafting is relatively straightforward. The key is that you need to sort your templates out before you can automate them. Your templates can also lead to playbooks and clause libraries (see Word extensions below). Applying technology to the negotiation stage, on the other hand, is a quagmire caused by there being two sides to a negotiation. Currently the best you can do is give tools to your team to help them be more effective in working with documents. In the longer term, negotiation platforms may radically improve the efficiency of the process, at least for simpler contracts. Document automation systems let you create tailored contracts by answering questions, usually through the browser (although some versions are built into Word). You should think of this as a one-shot process for the drafting stage - once the draft is produced, you will be working with it going forwards in Word (or you can generate a pdf). Improved business satisfaction by letting business users generate their own contracts safely. Some document automation systems can also help you automate approval processes. Answers to questions can trigger the process, so that contracts with particular risks are approved before being sent out. 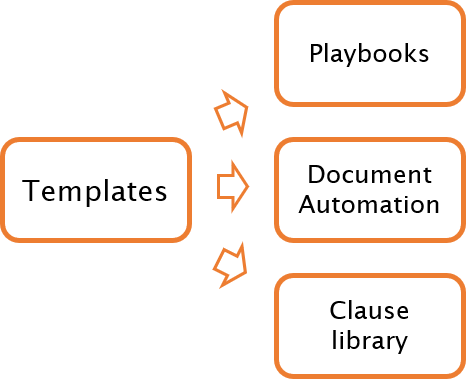 Document automation systems are incredibly valuable for speeding up your contracting processes, and a big topic, so we’ve written a guide dedicated to document automation. Document automation is for where you are producing the first draft. That won’t always be the case, and new tools are emerging to help automatically review simpler contracts on the other side’s paper, to flag areas of concerns. This is one of the areas where AI is starting to make an impact on commercial contracting. The challenge in applying AI is current computers’ capacity to “understand” contracts - reading comprehension and the ability to reason about the contract are both low. What computers can do is find clauses of a particular type with a reasonably high level of precision and, in some simpler cases, apply rules to guess what those clauses are doing. This can get you quite a long way, if you are looking for transfers of IP rights or indemnities. These tools are at an early stage, and though they may prove valuable, they still have some way to go. Our experience is that they can throw up marginal issues and need significant training. They can also be relatively expensive given the need to still read the agreement. But they can add rigour and may offer an opportunity to take a risk-based approach to low-value contracts. This is an area that is worth keeping an eye on if you have large numbers of similar low-value contracts being entered into on the other side’s paper. Some tools to consider include LawGeex, LegalSifter and ThoughtRiver. With negotiations come multiple versions of contracts and many emails. Law firms typically handle this with matter management systems to at least store the different drafts of a contract in a single place, and sometimes associated emails too. Some in-house teams have also adopted these systems. The advantage is to have everything in one place, helping lawyers keep track and ensuring that if a lawyer is unavailable another lawyer can pick up the project. They also help with later auditing, if required, of the transaction. Shared file stores (at its simplest, a network drive) can be used so that lawyers have a single place accessible by other team members for documents. There are more sophisticated document management systems that allow for versioning, local synching and enhanced search with filing within Outlook and Word. Emails can be stored in the more sophisticated matter management systems (with filing within outlook or even automatic filing using references in email subject lines). There are also simpler solutions such as copying in a shared mailbox with emails. Although this simpler approach has some downsides (it requires remembering to copy in or forward emails to the address, and relevant emails have to be identified within the mailbox if required later), it at least means the emails can be located if a lawyer is out. Emails of team members that leave your organisation can also be archived. Some research suggests that using search to find emails, rather than filing in advance, may be more effective. Lawyers like their autonomy. Telling them exactly how to work can be counterproductive. Extensive filing is not only boring but will slow down other work. In reality, auditing matters after signature is rare and is unlikely to justify filing all the emails and documents in one place, as long as they are locatable. The most important documents are the first draft, first mark-up and the final draft (as well as the signed version). We recommend focusing on capturing these and ensuring that you have a way for matters to be picked up by other lawyers if needed. Word is a powerful tool, but it is generic and not designed to handle the particular issues lawyers face. This can lead to incredible inefficiencies as lawyers fiddle with documents and deal with broken formatting. 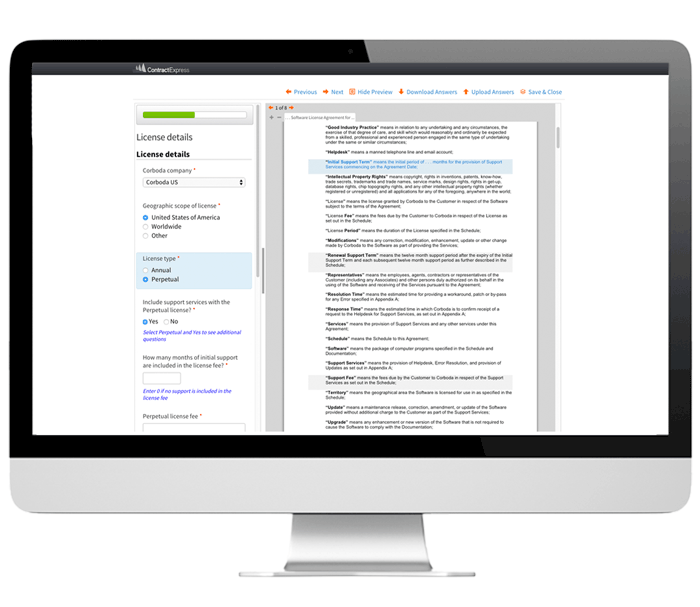 A number of suppliers, including Radiant with our RemarkableX tools, have extended Word, adding additional functionality targeted at lawyers. 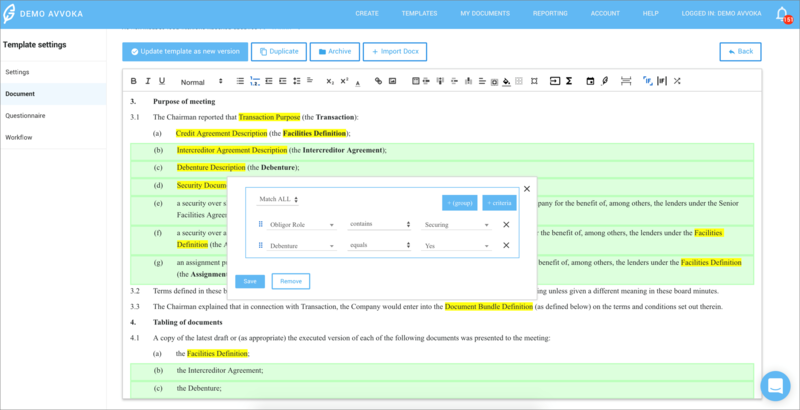 We have also extended Word to include a clause database, allowing lawyers to insert preferred language into contracts and grabbing useful clauses for future use. As we have noted above, one of the most valuable approaches to technology is to make sure that the users are able to use what is already available. Lawyers’ understanding of how to use Word properly, even without the extensions, can be patchy. A strong grasp of topics such as styles and Word styles templates (discussed in our guide to contract templates), keyboard shortcuts, automated cross-referencing and track changes is valuable, going on essential, and there are many resources on the internet to help. Procertas has an excellent assessment for lawyers’ use of Word (and Excel), if you want to know where you are. Batting back and forth drafts by email will only get you so far. When you have negotiation calls, they can be made far more effective by using screen sharing and live drafting of changes to contracts. This allows changes to be agreed on the spot, potentially closing a deal in a single call rather than sending drafts after the call and having to have a follow-up. For this to work, the lawyer doing the negotiation needs to be empowered to make decisions. It is also harder to draft on the fly (especially with everyone watching each keystroke!) but it is a valuable tool in speeding up negotiations. Screen sharing is usually an option in any video conferencing system (as opposed to audio only) such as Skype for Business, WebEx or GoToMeeting. Negotiations are the problematic stage in automating the end-to-end contracting process, with the current reality being the slow and inefficient sending back and forth of marked-up Word documents. Early attempts to improve this process involved providing platforms to host the draft agreement, accessible by both parties. Newer approaches involve hosting the draft contract as a web page accessible in the browser, where changes can be made to the contract and comments can be added. The platform then manages the exchange of “drafts” and allows open issues to be tracked, reported on and closed. 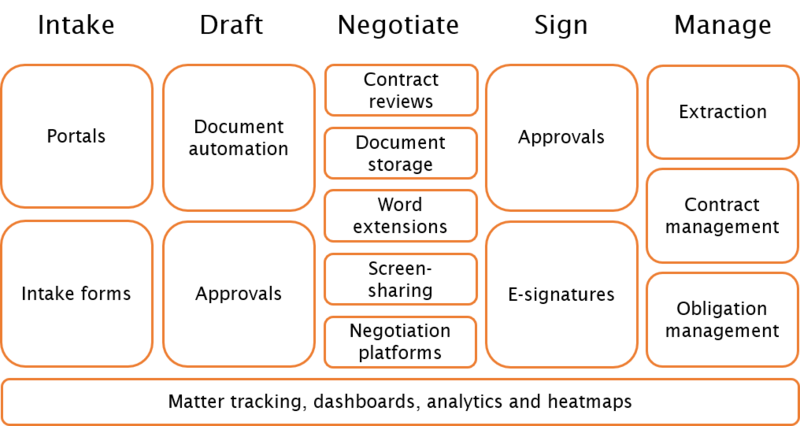 Although these systems will likely be highly effective in improving the contracting process, mimicking the complexities and flexibility of what we do with email, including the convoluted ways in which drafts can be sent both between, and within, organisations and the associated approval processes and touchpoints is hard. These platforms are showing great promise and can be effective with the simpler contract documents, but are only now approaching the maturity needed to handle more complex negotiations. We do not expect that really complex agreements, especially those that are typically negotiated face-to-face will be negotiated on these platforms for the foreseeable future. However, for simpler contracts these platforms are going to be increasingly used. The fundamental challenge is that it requires the other side to adapt their way of working, a far harder problem than the already hard problem of getting your own team to change. This will become easier as the systems mature, but it means that there is likely to be a slow adoption. We believe this is the future and are actively working with suppliers to help improve their products. Some of the end-to-end products we list above do contract negotiations. We like Synergist as a stand-alone product. There are fundamentally two types of data analytics that you can perform on your contracting process: data around the contracting process (primarily drawn from tracking your matters) and data around the substance of the contracts. There are a number of ways to analyse the data around your contracts, but a powerful method is to produce heatmaps. 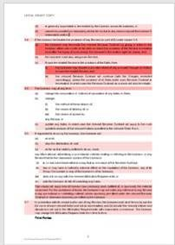 Heatmaps show the parts of your standard contracts that are most subject to negotiation, by analysing the other sides’ mark-ups. Sometimes these proposed changes are for predictable reasons, for example you are taking an out-of-market or debatable position. But they will also highlight clauses which are more contentious than they should be. Identifying these clauses will allow you to refine the language to address apparent concerns and speed up the negotiation process. We have built a tool to do this, which also identifies points to address in playbooks, and it is also available through some of the negotiation platforms. Electronic signature systems allow a contract document to be signed online, rather than relying on a manual signature. Most countries have now recognised e-signatures as legally sufficient for most, if not all, commercial contracts (although not always for documents where more formal legal requirements are required such as wills and trusts). There are a number of resources discussing where e-signatures are recognised as well as guidance from the City of London Law Society and the Law Commission in England and Wales. They are more convenient, improving business satisfaction with the process. It is demonstrably faster to obtain signatures this way, reducing the time to close. The approvals process can be automated, with a log confirming that approvals were actually given. These systems help ensure that contracts are actually signed. They help ensure that the signed contracts can actually be found again and they are an excellent feed into contract management systems to ensure that the signed contracts are then stored in a single place. At its simplest, e-signatures will allow the signer to attach an image of a signature to a document and log the process of how it was signed (typically identifying the signer by a unique link to their email address). More advanced signing processes (involving for example public key infrastructure, a chain of trust built using cryptographic certificates and physical devices) can also be enabled for advanced and qualified electronic signatures under EU law. E-signature systems can also assist with the pre-signature approvals process, allowing you to send the finalised contract to the approvers (in a pre-set sequence if needed) and requiring them to assent before it is finally signed. Alternatively, you can automate the approvals stage in a separate workflow system. 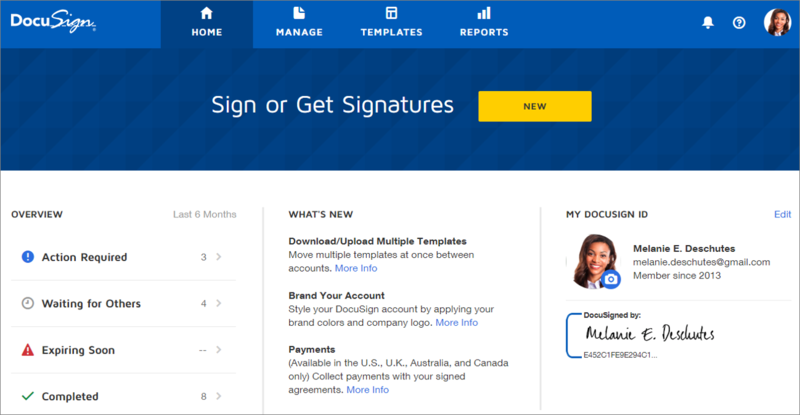 Examples of e-signature systems include DocuSign, Adobe Sign and HelloSign. One of the most common refrains we hear from legal teams is that they regularly can’t find their signed contracts. Although there are many systems available to help with this (over a hundred), the problem can still happen when you have one. This is because collecting (and actually managing) contracts is fundamentally a process, rather than technology, problem. Going a bit deeper, the two key justifications for a contract management system are finding contracts and knowing when they are up for renewal. If you have a process that ensures contracts are being stored in one place (such as somewhere on a network drive) and a spreadsheet listing renewal dates, you can meet those needs. In practice though, we often see large (and very expensive) projects to implement contract management systems to both store the signed contract and also large amounts of associated metadata. These projects often fail in the longer term because (a) the system is configured to require large amounts of data about the contracts (b) users don’t want to go through the pain of extracting that data so the system is avoided, (c) which means that the contract record is incomplete, and so the system isn’t trusted, (d) so users have even more reason to avoid the system. Effectively, trying to capture too much data is likely to start a cycle of non-use, but expensive systems are justified by the extent of knowledge that the organisation will have about its contracts. We therefore recommend that you use as simple a system as possible, require only a minimal amount of information be stored about the contract and rely on later data extraction exercises to answer specific future questions that come up (see data extraction below), because future questions are surprisingly unpredictable. Effective contract management is a big topic, but the data we would focus on collecting (apart from parties, renewal dates and type) are unusual long-term obligations on you (because you won’t comply with them if they aren’t made actionable) and changes to standard processes such as approvals (so that you know where there are issues with later bulk updates across your agreements). For high volume contracts, if you track these in your contract management systems you can deliver effective obligation management. For large value commercial contracts, such as outsourcing agreements, where you may have a dedicated team involved in ongoing management, there are specific systems that can address the far more complex requirements of obligation management, service level compliance and charges. Contract management providers were the first of the contracting lawtech providers and have often tried to expand their products into contract lifecycle management tools - i.e., handle all the stages of the contracting process. As we discuss above, there is a value to having a joined-up system, but these solutions can often be weak at dealing with individual stages such as document automation and at times can be more procurement box ticking exercises than fully-powered features. For standalone products, we like Effacts. SirionLabs handles managing large contracts. We’ve listed a number of end-to-end systems above and for a reasonably complete (and daunting) list of what is available, have a look here. 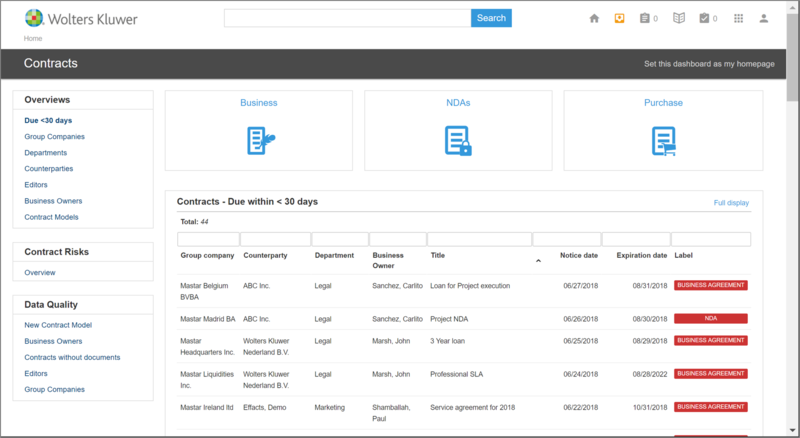 Once you have a contract management system to store metadata about your contracts, you can look at AI tools that automatically extract key data points from your contracts. Like other AI LawTech systems, these are still relatively immature, and work best when you are dealing with high volumes of very similar contracts where you know exactly which data points are relevant. You are going to want to check the results and unless you are dealing with extremely high volumes of documents (think banks with financing documents), their value is marginal. They also face the same challenges as the contract review tools we discuss above, with any limited rules you create to interpret the data (e.g., the term) being fragile if the actual language materially differs from what you expected to see in the contract. Another class of tools have also emerged for use in M&A due diligence exercises, to identify relevant clauses of a particular type, to speed up reviews by humans. These can be helpful in processing your contracts at a later date to answer specific questions (e.g., can the contract be assigned?). With the current hype around AI, there are a lot of new products coming on to the market. Seal is one of the stronger ones for data extraction, Kira is the best known of the clause-finding systems. Others include Ravn (now acquired by iManage), Counselytics (now acquired by Conga), eBrevia and Luminance. Introducing technology, in fact any change, is fundamentally about people. We are going to look at the key stakeholders first and then turn to how to approach implementing technology. With a few exceptions, IT departments don’t particularly care about the legal team (for probably a few reasons, including legal not being revenue generators). IT departments also have other problems. If you think the current rate of change is high in law (ho ho), consider what IT departments are facing: they live the hype-cycle, with the latest IT paradigm shift occurring every few years. Security has become a nightmare. They have had to evolve from supporting boxes, through providing services, to enabling business transformation. They can’t hold off the cloud any longer, yet they are inevitably hampered by legacy systems that they have to keep supporting. And their headcount is also being frozen, if not cut. In the face of this onslaught, IT teams know that they need to simplify: they need fewer systems, better integration and for the users to actually use the systems they begged for. create an overwhelming business case for your project. Whichever path you chose, you will inevitably need to understand the technology that is available and prioritise what will add the most value; and it helps to be able to articulate the business impact. Given the challenges with pushing LawTech through the IT department, sceptical GCs are guaranteed to lead to little progress. Previously, however, the GC would need to actively champion change (amongst their many other responsibilities). The interesting development over the past few years has been the new role of legal COO and the rise of legal operations in larger teams, as highlighted by the growth of CLOC. The creation of the COO role and legal operations teams is significant because there is now somewhere to delegate transformation. The result is that more progressive GCs with larger teams have a way to unlock improvements. understand what is available in the market and engage with experts outside their department and outside their organisation. The bottom line is that without both top-down support and someone to lead the implementation, there will not be change. In a large enough team, there will always be at least one team member fascinated by technology and up for experimenting. They might end up being drawn to legal operations, but not always. If you are reading this, you might well be a tech champion. At the other end of the spectrum are the deep sceptics, who are far more common amongst lawyers. In between you have a range of attitudes, with people more or less open to change (for more on the different attitudes to change, see the Rogers Diffusion Curve and Bill Henderson’s excellent application of this to law - read the whole site, while you’re there). So how do you address these different attitudes? Ignore the deep sceptics at first. You will waste time and effort with little chance of success. Better to get going and bring them on board later. The contracting processes are bigger than legal. They span departments including procurement, sales, finance and the contract owners in the business. LawTech providers are already talking directly to these other groups because of the historical challenges of selling to legal (it’s hard). Document automation is usually first introduced at companies through sales (to handle the simplest agreements); contract management systems are usually championed by procurement (because they want to understand savings opportunities across categories). Legal has come late to the party. Coordinating changes with these other groups will often be essential and they may be better able to persuade the IT department to introduce a system. We recommend bringing them onboard with your project early on. Momentum: starting with small wins and building an ethos of continuous improvement will help set the context in which more ambitious projects can be rolled out. Have a plan: you need a plan for how the system will be rolled out and you need someone to be accountable for delivering it. That person needs to be empowered and publicly supported from the top. You also need to budget not only for the system, but also for the full implementation costs and training that will be needed. The costs of implementation can be significant, in some cases more than the cost of the system itself. Selling the benefits: you are going to need to sell the benefits, not just to the organisation but also the individual lawyers. This is not just a one-off event. Communication throughout the project is going to be essential. The basic rule is that you cannot over-communicate. Minimise the pain: you are going to want to select and implement the system in a way that makes the personal process of change as small as possible. This means pilots, testing and knocking the edges off the system before rolling it out widely. Champions and Beachheads: We recommend getting a system going with champions first, to ensure that you can demonstrate a fully working system, before a wider roll-out. Training: Training is usually essential, but it doesn’t necessarily have to be done by external providers. Often enthusiastic champions are the best people to train the rest of the team. Finally, pick up the sceptics: Once the new system is in place and working, then you can address the sceptics and do what you need to do to get them using the system. Persistence: There will be set-backs and not everyone is going to leap at the opportunity to use the new system. Keeping at it, when you know the system does work and help, is going to be essential (keeping at it with a fundamentally flawed system is less helpful). LawTech is exciting, but while there is much talk, little is actually being used by in-house teams. Legal is far behind in its adoption of technology and the risks associated with change are outweighed by the heavy costs of inaction. You don’t, however, need to do this on your own. Your company already has a number of tools that can be used right now and suppliers such as Radiant can help you both implement technology and provide technology-enhanced services.